Rajendra K Pachauri is an internationally recognized leader on environmental and energy issues and their policy dimensions. As CEO of New Delhi-based TERI (The Energy and Resources Institute), Dr. Pachauri oversees a staff of more than 1,200 employees engaged in the research and development of solutions to global problems in the fields of energy, environment and current patterns of development. He is also Chairman of the Intergovernmental Panel on Climate Change (IPCC), the world’s leading intergovernmental organization for the assessment of climate change. 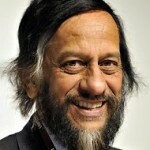 Dr Pachauri, who serves on a voluntary basis, was elected Chairman in 2002 and reelected by acclamation in 2008. Dr Pachauri is an economist and industrial engineer by training and has held numerous academic posts in addition to his work with TERI and the IPCC. He has co-authored above 130 papers, a large number of which are peer-reviewed, and written or co-written 27 books.